Are the second largest big cat species in the world - second to tigers. Can reach speeds of up to 50 miles per hour, in short bursts. The roar of lion can be heard 5 miles away. Lionesses are better hunters and complete 90% of the hunting. Rest for about 20 hours a day. Eat mice, lizards, tortoises, warthogs, wildebeests, zebras, buffaloes, young elephants, rhinos, hippos and giraffes. Can go 4-5 days without water, if they have to. 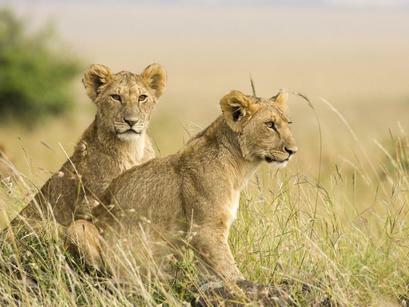 When a male takes over a pride, he usually kills the cubs. Lions cannot roar until they are 2 years old. Male lions can sleep up to 20 hours a day. A Liger is the offspring of a lion and a tiger. Lions in the wild usually make no more than 20 kills in a year. There are more statues of lions in the world than there are real lions. Can get hairballs the size of footballs. Mountain Lions are also known as Cougars, Catamounts, Puma, Screamer, Pantha.